Fits: Celestron 5 inch (13 cm) f/10 SCT (C5, NexStar 5SE) with black Phillips factory collimation screws. These screws have metric threads. Note 1: These knobs will fit only 2006 and later C5 models that have black Phillips factory collimation screws. 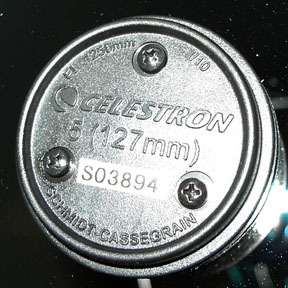 All C5 models made prior to 2006 and all post-2006 models with silver factory collimation screws require C5 standard knobs. Check that our screw threads match the factory screw threads before installing.